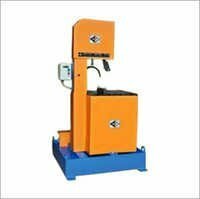 Incorporated in 1994 at Vadodara (Gujarat), Multicut Machine Tools has emerged as one of the most trusted Band Saw, Bandsaw Machine, Auto Band Saw Machines manufacturers in India. We are one of the most proficient manufacturers, exporters and suppliers of Automatic Circular Saw, Double Column Horizontal Circular Saw, Slitting Machines, etc. Looking for Bandsaw Machine ? Certification : AN ISO 9001 : 2015 MACHINE TOOLS CO.
Bandsaw Bandsaw Very Useful for preparing specimen of big size in Anatomy and Meat Departments. Fitted with large moving table and extension table operated on four ball-bearing... Certifications : ISO 9001, ISO 14001, CE Delivery Time : 7 Days FOB Port : Mumbai Main Domestic Market : All India Main Export Market(s) : Africa, Middle East, Western Europe, Eastern Europe, South America, North America, Central America, Australia, Asia Packaging Details : Packed in a case. Bandsaw machine makes industrial cutting jobs easier. How to choose this machine ? Bandsaw machine is a specialized cutting machine that is capable of slicing through almost anything from wood to plastic sheets and from meat to metals. The history of bandsaws dates back to the early 19th century England when it was first devised by William Newberry. Though Newberry managed to obtain a patent for his invention, these machines were not immediately fit for use as some technical problems made the welding between the blades and the wheels fail. However, from the mid 19th century there has been a drastic change in saw technology and these saws has become more sophisticated as well as easier to use. Nowadays, these cutting machines are widely used in almost each and every industrial sector and can be defined as a major technical resource. Probably the most vivid application of this saw can be seen in the wood and timber cutting industry where there is a need of fast and continuous cutting process. Depending on the expected use cutting head can be of different thicknesses and are equipped with features that do not allow the saw to undergo metal fatigue during the cutting process. The efficiency of the tools largely depends on the size and design of the teeth and so it is better to consult an expert before purchasing one. Bandsaws used for metal cutting are generally available in two designsâhorizontal and vertical. The average band speed of these saws range between 40 feet to 5,000 feet per minute, though special saws designed for cutting super tough metals have band speed of 15,000 feet per minute. The saws are fitted with brushes in order to prevent the accumulation of chips and metal fragments in to the cutting head. Due to the availability of a large number of almost identical products in the market, it is sometimes hard for users to choose the right kind of bandsaw machine from the range of options they are offered. Hence, it is always better to take the help of a professional expert in this regard, an expert who would be able to provide proper guidance to buyers regarding the purchase of these saws. *Driven by electric power, these machines are capable of cutting through objects faster than manually operated saws, thus saving time in the production process to a large extent. *It is not hard to maintain these machines in a proper way and so it is possible for the bandsaw machine to deliver impeccable performance for a long time. * These machines are available at affordable costs and can also be ordered online.